–At our exotic wood stain inspection after 1 year we observed 70% color retention. Considering the dense nature of IPE this was a fair amount of color retention compared to other hardwood stains we have tested. –No peeling was visible after 1 year. This is common for a good penetrating oil stain. Even the high traffic areas showed no peeling or wearing. –IPE Oil Stain for Hardwoods is on the more expensive side at $60.99 per gallon. Luckily IPE Oil has a great coverage rate. We experienced a coverage rate at over 300 square feet per gallon. This is twice the coverage rate of softwoods. For our 600 square foot IPE test deck, we used 2 gallons in total. –There was some mildew present after 1 year on the outside rails and in some corners. –IPE Oil Hardwood Stain was applied using a stain pad. We back wiped excess stain after waiting 20 minutes. Coverage was very good and the whole stain project was finished in 3 hours. – With small amounts of mildew growth, there was no noticeable darkening or color shifting with IPE Oil Hardwood Stain after 1 year. –Prior to a recoat of IPE Oil Hardwood, a thorough cleaning would be needed using a wood cleaner to rid the wood of dirt and grime. This is all that would be needed for a proper prep before a recoat of IPE Oil. –Besides the user-friendly application and excellent coverage rate, the finished appearance is very rich. 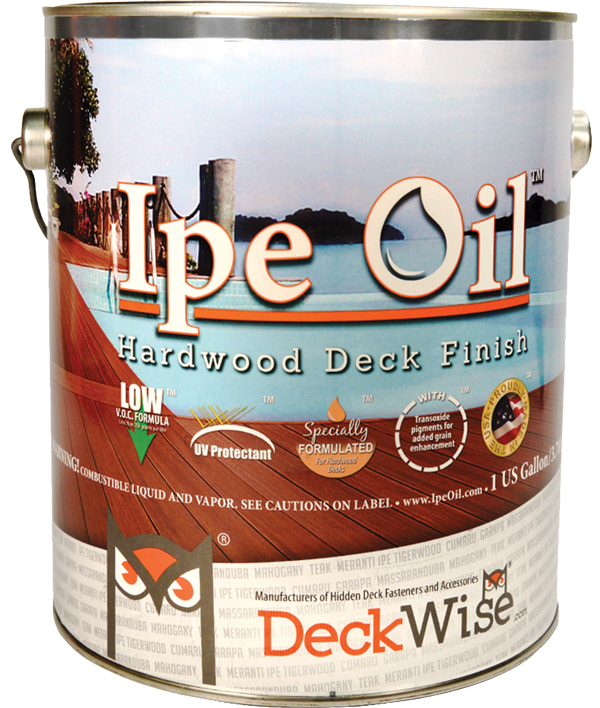 We believe that IPE Oil Hardwood Stain is a decent product for any exotic hardwood that requires yearly maintenance. what are your thoughts on Flood CWF for Hardwood? Average. Not the easiest to maintain. There are better options for exotic hardwoods. Just finished new Ipe deck and siding on home in coastal home in Montauk NY. We are preparing to use Ipe oil throughout however painter informed us that we may prefer to let this gray naturally without initially staining if we are not prepared to re-stain annually as we may see peeling on edges and other adverse problems if we skipped a year or two. He recommended a clear preservative instead. Do you have any thoughts on this? Also, it appears that parts of our deck that have received more sunlight than the siding have already grayed faster than the siding by the time the home was complete. Do you recommend any special procedures prior to oil application in the different areas? 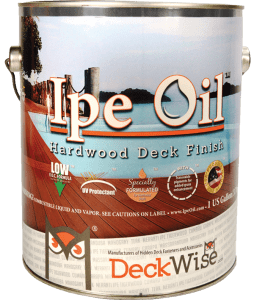 IPE is a penetrating oild so it does not peel. It will need to be reapplied annualy or sooner. Nothing lasts more than a year on IPE. You must clean and brighten all wood for the intial prep. This will remove any gray and any mill glaze. Do you see any issues if we were to decide to let it grey later down the line after our initial application? Can I use this on my cedar deck to get better penetration of the oils & color? You can use this on cedar.